I was exporting the results and running it through a perl script that would parse out by brand with expiration date for Track 2. Modified versions of my script would just do PANS or Track 1. This is very useful stuff for a variety of analysis, but in particular the PCI forensic audits. The caveat is that even if three tests are successful...length, BIN combinations, and Luhn formula...you still do not know if you have legit, issued credit card numbers without taking them to the brands. IsValidCreditCard() simply checks Luhn's algorithm. 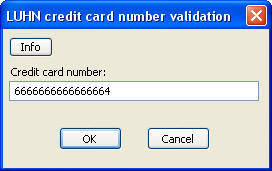 I've reviewed its correctness before... works well, but I don't think it accepts >16 digit numbers. Good idea using the prefix codes for validation. I tried to read this post but have NO CLUE what it's about...LOL! I just stopped by to say, "Hi!"